My husband and I have been struggling lately to find the time and the funds to squeeze in date nights or dinners out... you know, just the two of us. With my son smack dab in the middle of his cross country season, an almost 20 month old who is still mama's little nursling, and my husband's not always date friendly work schedule (he works almost every weekend), it is difficult to find a day and time during the week that works for both us and for a babysitter (aka, usually my parents). And then there is the whole single income thing. Fancy dinners out are now reserved for very special occasions. Dinners in are now a date night staple for us. So what is a time crunched, money strapped couple to do to carve a little date time out for themselves? Maintaining our relationship and the couple part of us is important to us both. 2. Head to a local coffee shop for a couple slices of pie or cake and some coffee. This is one of our favorites. We canoodle at a little table in a corner, get to enjoy some delicious desserts and of course, each other's company. 3. Weather permitting, stop at a local ice cream shop and pick up a couple of cones or sundaes (or maybe a banana split to share?) and head to a nearby park to walk, eat ice cream, and hold hands. 4. Do a quick Google search and see if there are any local festivals happening in your area. Most festivals are free to get into, and there is so much to see and do at them. Check out local attractions, artisans, and have a bite of some local favorites. Become a tourist in your own home town. 6. Break out the board games! And maybe a glass of wine or two. Sometimes in this day and age of XBox and Playstation, we forget how much fun connecting over actual, tangible board games can be. Play some Uno. Get out the Battleship. Heck, we even like a friendly game of Connect4. Make some friendly wagers to keep it interesting. What are some ways you stay connected to your significant other when time and money are obstacles? 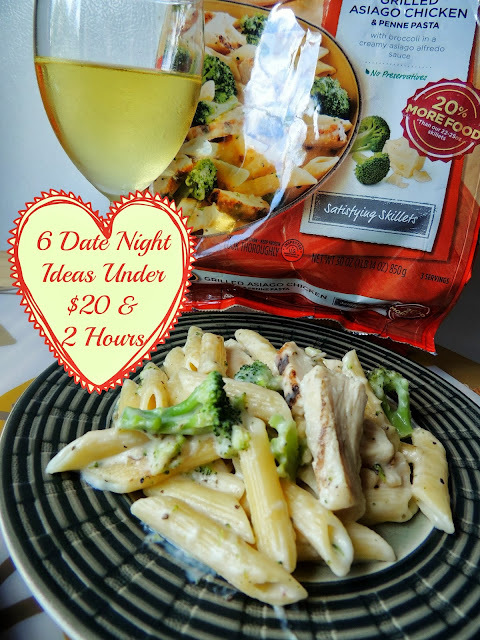 For more budget friendly and tasty dinner options whether for date night or beyond, be sure to visit the Stouffers Facebook page or follow along with Nestle USA on Twitter.